"[The Patriots] played like champions," Belichick said. "Everybody counted us out from the beginning of the season, the mid-season, but we're still here." Wide receiver Julian Edelmen was named Super Bowl LIII MVP, after a remarkable showing with 149 yards and 10 receptions. "It was an unbelievable year," Brady said after the game. "We fought through it more so than anything. It's unbelievable to win this game." For the second time in as many decades, the Super Bowl featured a David versus Goliath clash between the Patriots and the Rams — but this time, the teams had swapped roles. The Rams weren't the big, bad favorites they were back in 2002, the last time they met the Patriots on the NFL's biggest stage. And the Patriots didn't stride onto the field as the lovable underdogs they were when Tom Brady was just a blushing sophomore. 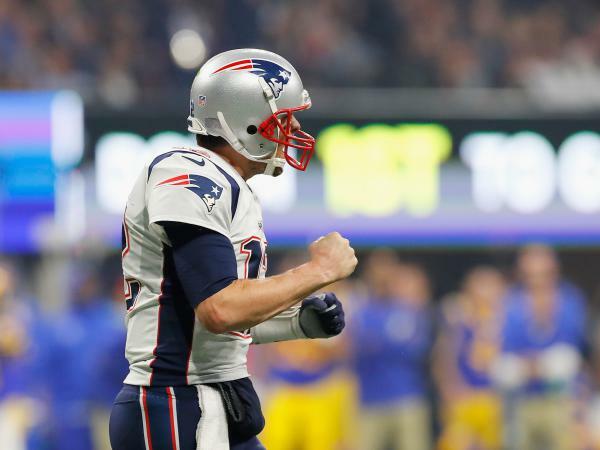 These days, the Rams hail from Los Angeles, Brady's Hall of Fame career is old enough to vote and the question on the minds of everyone outside New England before the big game was some variation on the following: Could the Patriots please quit winning already? At the outset, pressure from the LA defense looked like it could pose an insurmountable challenge to quarterback Brady. That proved not to be the case. The Patriots put the first points on the board with a second-quarter field goal, answered in the third-quarter by the Rams. But the teams went the first three quarters of the game without a touchdown — a first in Super Bowl history. Viewers complained about the low-scoring game, while commentators suggested that Rams kicker Johnny Hekker's record for the longest punt in Super Bowl history – at 65 yards – was the most exciting part of an otherwise incredibly boring night. And then the Patriots scored the first touchdown of the game. An impressive 29-yard catch by tight end Rob Gronkowski brought the Pats within scoring distance, and running back Sony Michel sealed the deal with a 2-yard touchdown run. Any hopes for a comeback by the Rams were more or less dashed by a Stephen Gostkowski field goal for the Patriots in the closing minutes of the game. "Coach Belichick did an outstanding job," said McVay after his team's loss. "There's really no other way to put it. You know, I'm pretty numb right now, but definitely I got out-coached." The Patriots are now tied for most Super Bowl victories with the Pittsburgh Steelers — six apiece. It's their second victory in three years. And although the game was the lowest scoring in Super Bowl history, it was also the highest margin of victory for New England in any Super Bowl. We were here, live-blogging it all — read through it all below. Plus, because we're NPR, we also solicited your poetry. You sent us your best Super Bowl haikus – with the hashtag #superbowlhaiku — and they were so great that we forgive you for how many were about how bored you were during the game. The Patriots have won it again. A fourth-quarter touchdown for the Pats – and a quick field goal in the last few minutes – left the final score at 13-3. The Patriots are now tied for the most Super Bowl titles with the Pittsburgh Steelers at six apiece. It was the first Super Bowl without a touchdown in the first three quarters, but it won't be the first with no touchdown at all. Running back Sony Michel scored the first touchdown to give the Patriots a seven-point lead. The play followed an impressive catch by fan-favorite Gronkowski, who deftly avoided defenders to march the Pats far down the field. That brings the score to 10-3, or a cumulative 13 points, with fewer than 10 minutes remaining on the clock. The lowest-scoring Super Bowl in history was Super Bowl VII, when Miami won 14-7 — that's 21 total points. And with a 53-yard field goal at the end of the third quarter by LA's Greg Zuerlein, the Rams have tied the game a 3-3. In a worrying development for the Patriots, strong safety Patrick Chung left the field with an arm injury and will not return. "Chung [is] one of the unsung players of the latter part of this Patriots dynasty," writes FiveThirtyEight's Neil Payne. "He's fifth on the team in starts this decade." On the Rams side, Jared Goff has continued to struggle to keep pace with Brady. The LA quarterback has taken an average of 3.20 seconds to throw the ball, compared to Brady's 2.38, according to NextGen Stats. But Johnny Hekker's eighth punt (more than any he's had in a game this season for the Rams) did set a record for the longest in Super Bowl history, at 65 yards. Commentators say it might be the most exciting part of the game, which, if true, is not a promising sign for viewer numbers. A "professional, tuneful, mildly exciting" halftime show, NPR's Eric Deggans says. "Not enough fireworks, gospel choirs or drumlines in Atlanta to move the needle higher on that one." Deggans has also been following advertisements, the other highlight of the evening. If you're curious about how companies spent their millions on prime time advertising this year, he's tracked the hits and misses. Not sure it makes sense for Audi to spend #SuperBowl ad money to tell me their fleet of cars will have a lot of electric models six years from now. Lots of $$ telling me what your product isn't right now. All is fair in love and advertisements. More from him on Twitter. The game is halfway done, and the Patriots are still up three. It's been a surprisingly low-scoring game for a couple of the strongest offensive teams in the league, not to mention the second-lowest scoring first half in Super Bowl history. The Pats so far have a missed field gold, a turnover on downs and a Tom Brady interception — which helps explain the stark difference between their huge lead in yards and small lead in the game. The official commentators have had their say all night — but you've also been giving us your takes. Here are some of our favorite haikus hitting on everything from the game itself, the snacks and Colin Kaepernick. Keep sending by using the hashtag #SuperBowlHaiku. The first points of the game went to the Patriots, as Stephen Gostkowski made his second attempt at a field goal, this time from 42 yards. Halfway through the second quarter, the score is now 3-0. One name making a mark so far this game for a series of sharp plays is Patriots wide receiver Julian Edelmen. Early in the second quarter, the 32-year-old player had 74 yards alone to the Ram's 32 cumulative yards. It's nothing new for Edelman, who has the second-most postseason receiving yards in NFL history — after Jerry Rice. The site SBNation has even drawn a comparison between Edelman and Rice. Several notable absences tonight: Cardi B, Jay-Z and Rihanna all turned down the chance to perform at halftime in a show of support for former San Francisco 49ers quarterback Colin Kaepernick, who became the first player to take a knee during the national anthem to protest racial injustice and police brutality. He has filed a grievance against the NFL, alleging that teams have colluded to keep him out of the league. Support for Kaepernick has been widespread on social media tonight. #I'mWithKap started trending before the game, with tweets from New York Times columnist Charles M. Blow, rapper Common, comedian Nick Cannon, film director Ava Duvernay and actress Jodie Turner-Smith, among others. "I will not be a spectator, viewer or supporter of the #SuperBowl today in protest of the @NFL's racist treatment of @Kaepernick7 and its ongoing disregard for the health + well-being of all its players," DuVernay wrote. "To watch the game is to compromise my beliefs. It's not worth it. #ImWithKap"
Basketball stars LeBron James and Kevin Durant were both spotted in No. 7 jerseys — Kaepernick's old number — in support of Kaepenick over the weekend. The first quarter came to a close with the score tied at 0-0. Stephen Gostkowski missed the Patriot's first field goal attempt of the night, from 46 yards away. Patriot's tight end Rob Gronkowski, better known as "Gronk," did notch a new record in his belt, according to ESPN Stats and Information, when he made his 18th career catch in a Super Bowl. He now has the most catches by a tight end in Super Bowl history. The Patriots kept up their streak of never scoring a touchdown in the first quarter of a Super Bowl. Just minutes into the game, the Rams — who also won the coin toss — made their first interception. Nickell Robey-Coleman jumped high and knocked the ball out of the air — and Cory Littleton slid in to make the catch. It was a rare interception for Brady, who has twice thrown 48 passes without an interception in a Super Bowl, and a potentially positive sign for the Rams. Meanwhile on the sidelines, Coach McVay's "get-back guy" is hard at work already, keeping the young coach out of the game's way. What's up with Wade Phillips' coat? It's over 60 degrees in Atlanta ahead of kickoff – a balmy evening on the heels of the recent polar vortex — but Wade Phillips, defensive coordinator for the Los Angeles Rams, strolled into Mercedes-Benz Stadium sporting a heavy sheepskin coat. Phillips, the 71-year-old veteran working with 33-year-old head coach Sean McVay, paid tribute to his late father with a coat and cowboy hat identical to Oail Andrew "Bum" Phillips' renowned outfit. 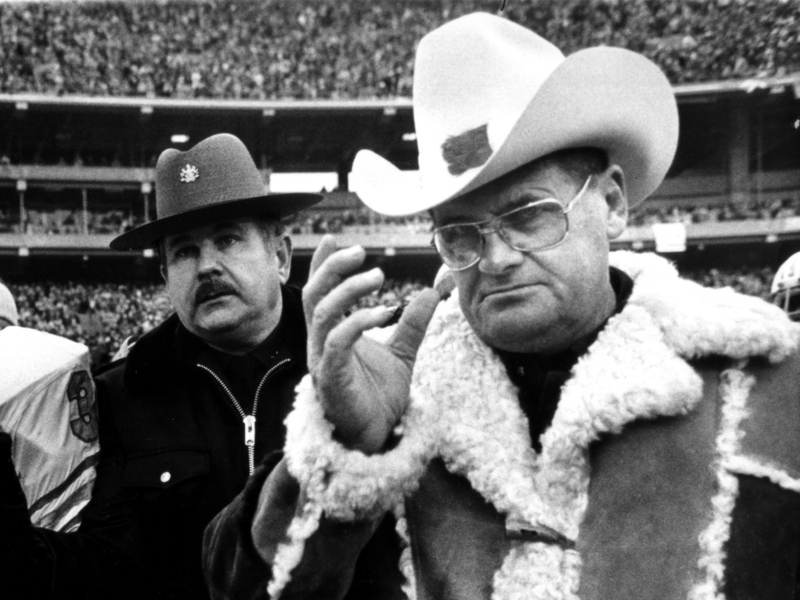 Houston Oilers coach "Bum" Phillips sports his trademark coat and cowboy hat as he leaves the field after losing to the Steelers in AFC championship in Pittsburgh in 1980. Bum was a head coach in the NFL in the 1970's and 80's, first for the dominant Houston Oilers then for the New Orleans Saints. He cut a striking Texan figure as he strolled the sidelines in his unmistakable cowboy hat and boots. "Bum Phillips was a country cowboy, never met a stranger, was a great player's coach," John McClain, who has covered the NFL for 40 years, told NPR in 2013. "He would stop practice, and he would have an ice cream truck come on the field." Bum died in 2013, at the age of 90. The younger Phillips — who is currently the second-oldest coordinator in the NFL — has written a book about his father, "Son of Bum: Lessons My Dad Taught Me About Football and Life." The long list of luminaries who have played the Super Bowl Halftime Show includes Michael Jackson, Prince, Beyoncé, Madonna, Paul McCartney, The Rolling Stones, The Who, U2, Tom Petty, Lady Gaga, Justin Timberlake, Bruce Springsteen... and as of Sunday: Maroon 5. Whatever artist finally agreed to perform, it was going to be seen as controversial. Maroon 5 is defending their decision, even in the face of petitions asking them to drop out. And: Alfonso Cuarón's Roma is nominated for 10 Academy Awards, including plenty of big ones -- Best Picture, Best Foreign Language Film, Best Director, Best Actress, Best Supporting Actress, Best Original Screenplay. Its 10 nominations tie it with Crouching Tiger, Hidden Dragon for the most ever by a foreign-language film. And this hour Roma becomes the 12th Oscar-nominated movie The Nose has covered. Excitement over the Super Bowl continues to mount here in New England, as the Patriots are set to battle the Los Angeles Rams on Sunday night. While playing in the Super Bowl is nothing new for the Pats, the ability for fans to place a legal wager on the game here in the region is new. The U.S. Supreme Court ruled last year that a federal ban on sports betting was unconstitutional. 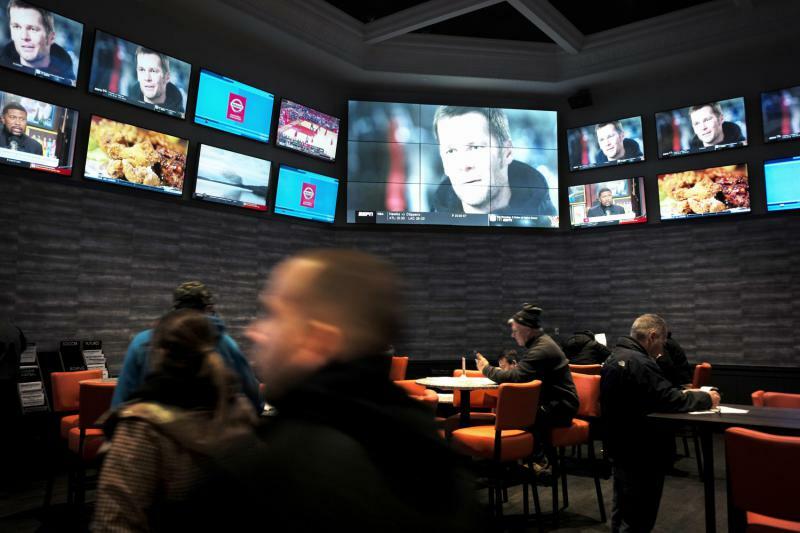 And in New England — so far — sports betting is legal at a pair of casinos in Rhode Island: Twin River, in Lincoln; and Tiverton, just over the Massachusetts state line from Fall River.